Heaven held its breath. The angels waited in anticipation while most of the earth slept, unaware of what was about to take place. Some humans who were awake spent the night weeping. Others tossed and turned, their minds filled with questions and doubts. Some sat and stared, while a few hid the night away in fear. Jesus kept that promise. In spite of the fact that the chief priests and Pharisees asked Pilate for an order to secure His tomb; in spite of the fact that Pilate had a seal placed on the heavy stone that blocked its entrance; in spite of the fact that guards were appointed to safeguard it; and in spite of the fact that Satan used all the power he possessed to keep Him in the grave—nothing could prevent Jesus from keeping His promise to rise again! But because Jesus’ disciples had forgotten His promise, when they first heard the news that He had risen, they didn’t believe it. So Peter and John raced to the tomb to see for themselves. And even after they saw that it was empty, they still had a hard time believing it was true. Many people today don’t believe it either. They view the story of Christ’s resurrection as a fable, not a fact. But we, too, can see the empty tomb. We can see it by reading the Bible’s account. We have written evidence. But the same enemy who tried to keep Jesus in the grave tempts us to doubt: to doubt that the Bible is accurate, doubt that such a miracle could happen. Yet we have the opportunity to be the people Jesus talked about when He said, “Blessed are those who have not seen and yet have believed” (John 20:29). I personally believe this Bible story and wish I could have been there on that Resurrection morning to feel the earthquake beneath my feet, to watch the heavy stone being rolled away by an angel sent from heaven, and to shade my eyes from the brilliance of Jesus’ form as He appeared at the tomb’s entrance. The earth had never before felt such power. It was the power of a God strong enough to conquer death! The best news anyone could ever give you is this: “He’s alive!” These two words take care of every problem, every heartache, every hopeless feeling you have. They are your answer. They are your healing. They are your hope. So don’t believe the lie. Don’t believe that what you’ve done in the past can’t be forgiven. Don’t believe the lie that you aren’t good enough for God to forgive. He died because He loves you. He couldn’t stay in the tomb because He loves you. All you have to do is ask. He’s more than willing to forgive—He longs to forgive you. And it gets even better than that. Not only does He forgive, but the Bible also says He forgets: “I, even I, am He who blots out your transgressions for My own sake; and I will not remember your sins” (Isaiah 43:25). Incredible! He forgives, and He forgets. And then He goes even a step further—He makes you new. No conversion story is closer to my heart than that of my dad. I was 10 years old at the time, but the memory of the event hasn’t faded much. Dad was very successful, and he thought he had everything he needed to be happy. But one night, after returning home from a party, he told Mom that he felt something was missing. So he started reading a Bible that a relative had “accidentally” left at our house. He would read late into the night after all of us were asleep and again when he awakened in the morning. He even glanced at it while driving to work. Each night after dinner he sat in his favorite chair and read. Dad’s conversion was contagious. Before long, our whole family—including my atheist mom—became Christians. Jesus offers you a new heart too. It starts by seeking Him, as Dad did. Seeking Him through His Word, the Bible, and through prayer. Then the closer you come to Him, the more your heart will become like His. Last year I attended the funeral of a friend who died after a courageous two-year battle with cancer. She left behind a husband and two teenage boys—right before the holidays. Standing by her casket with her husband, I looked him in the eye and said, “She’s not staying in there, Paul.” He replied with tears and with confidence, “I know.” You see, Paul knew that even though Marla had lost her battle with cancer, she’d win the ultimate battle against death and be resurrected at Jesus’ second coming. This life is not the end for those who believe in Jesus’ resurrection, because His resurrection guarantees our resurrection. When Jesus’ friend Martha was deeply grieving the death of her brother, Jesus promised her, “I am the resurrection and the life. He who believes in Me, though he may die, he shall live. And whoever lives and believes in Me shall never die. Do you believe this?” (John 11:25, 26). I do. I believe this with all my heart. Like Martha, I, too, had a brother who died. But because Jesus is the Resurrection and the Life, I know that Dan’s death is only temporary. He will be awakened at the second coming of Jesus—and he will never die again. Instead, he will spend eternity with our family in heaven. Whether we are alive when Jesus returns or we wait for Him in the grave, someday we will be changed “in a moment, in the twinkling of an eye, at the last trumpet” (1 Corinthians 15:52). Once this bodily change takes place, you won’t have the struggles you have now. Your tendency toward sin, your frail physical frame, your mind clouded with darkness—all will be gone. This is the hope we must hold on to until Jesus comes. To give up now because life is hard would be to miss out on, literally, the chance of a lifetime. What if Jesus hadn’t conquered the grave? What if Jesus had lost and Satan had won? Simply put, we’d have no hope. No hope of a world without war, poverty, and famine. No hope of living a life without physical or emotional pain. No hope of gaining pure, sinless bodies. No hope of seeing our deceased loved ones again. No hope of living forever. On Jesus’ resurrection morning, two women went to visit the tomb, assuming that He was dead. But instead of finding Jesus’ dead body, they found two angels, who said to them, “Why do you seek the living among the dead? He is not here, but is risen!” (Luke 24:5, 6). We often look “among the dead,” as it were. 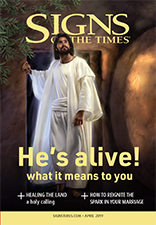 We focus on all that’s wrong in the world, when we need to look among the living to our risen Savior—the One who said, “I am He who lives, and was dead, and behold, I am alive forevermore” (Revelation 1:18); the One whose resurrection has so much to offer our present as well as our future. He has risen! This one fact changes earth’s history. This one fact can change your history. Someday Jesus will burst through the sky just as He burst through the tomb. And once again, nothing will hold Him back. Considering all this, what does Jesus’ resurrection mean to you? Everything. It means everything. Nancy Canwell is a freelance writer who lives in College Place, Washington, USA. She is an associate pastor of the Milton and Blue Mountain Valley Mission Seventh-day Adventist churches in Oregon. * All Bible verses in this article are quoted from New King James Version®. Copyright © 1982 by Thomas Nelson. Used by permission. All rights reserved.